We recently had a beautiful Pergola added to our back patio. We have been long awaiting the shade. Wunderdad made the comment that he wished we could get some new patio furniture to put under it, but alas, patio furniture is EXPENSIVE! “Oh well” I thought, maybe next year. Then I decided to show him a picture of some patio furniture made from pallets. To my surprise he loved them and decided to take on the challenge. This weekend, guess what we did? We (he) BUILT an outdoor sectional couch with pallets! It is huge and oh so awesome! All that is left is for me to make the cushions but I just couldn’t wait to show you all how it turned out. 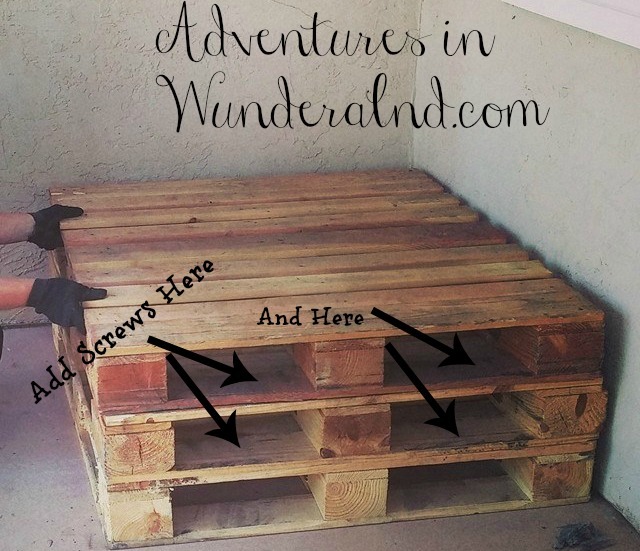 So here are simple instructions on how to build an outdoor couch with pallets: Part 1. I will post part 2 as soon as the cushions are finished. The building plans for this are VERY simple. And the total cost of this portion of the project is just around $40 (you just have to hunt down some pallets). 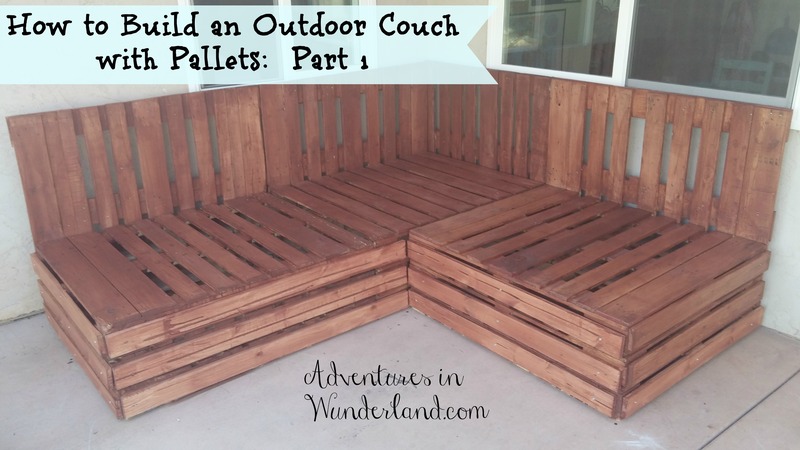 So let’s get start with how to build an outdoor couch with pallets. 1. Start by stacking your pallets. We chose to go three high, even though several pictures we saw online were only two high. Three pallets high, is approximately the same height as an indoor couch though so that’s what we went with. 2. Once you have them placed, connect them with screws. 3. Repeat with screws on opposite side. 4. To make the back of the couch, you will need to remove the back of one pallet. I found this youtube video to be helpful. 5. Once you have removed the back of the pallet, screw the face of it to the back of your pallet stack to form piece one of your sectional. 6. Repeat with sections 2 and 3. The only difference is on your corner piece, you will be adding a back and a side. The side piece will be a bit long and will need to be cut down approximately 8″. 7. Sand all tops and edges. This is where having an electric sander comes in handy. If you do not, I recommend using a brick so you have something to grip while sanding. It does not need to be perfect but you want to get rid of any rough edges. 8. Stain each of your pieces and let dry. 10. Add your front facing pieces with your cut lengths of 1 x 4″ wood pieces. I recommend measuring your lengths yourself as not all pallets are uniform. Screw the piece on. 11. 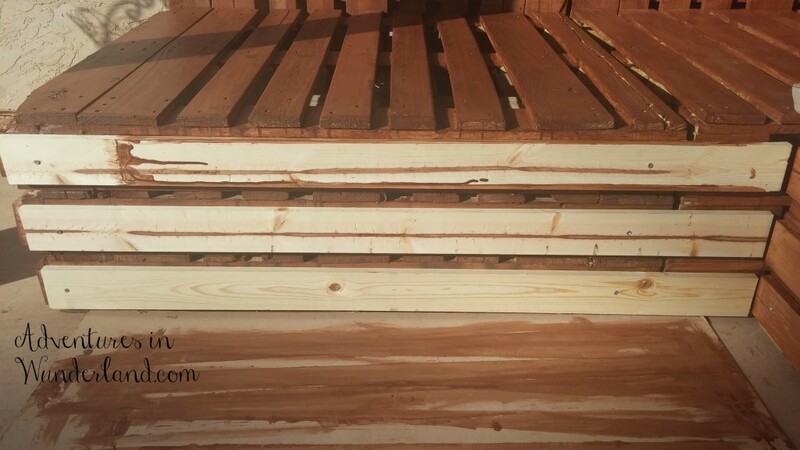 Finish with staining your front pieces and allow to dry completely (1 gallon of the stain and seal should be exactly enough if you don’t waste any. If you have a 6 year old that decides to paint the concrete with it, you will need an additional gallon). I am SO pleased with how our Pallet Couch turned out and I cannot wait to get the cushions finished! 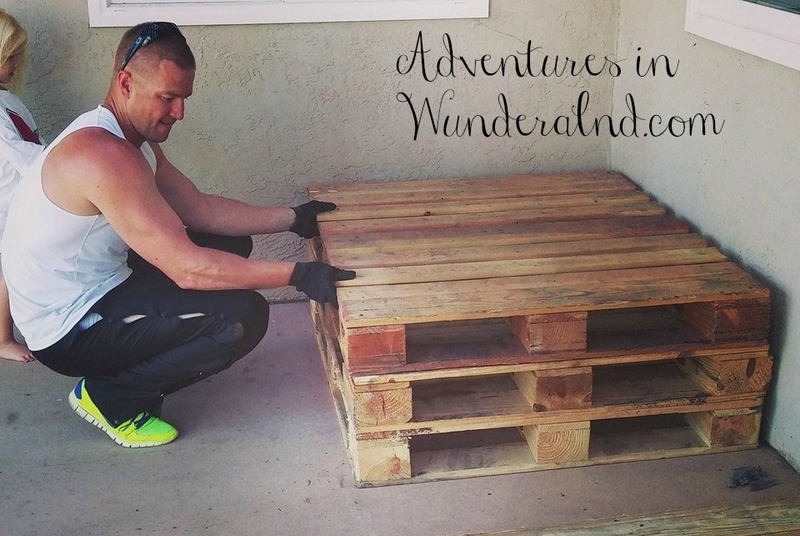 Stay tuned for part 2 of How to Build an Outdoor Couch with Pallets, where I’ll show you how to add the cushions. Rachael! OMG! Beautiful job on the sectional. Nice job Corey! Thank you Jennifer! I'll be sure to head on over and share. I can't wait to show the finished project with cushions! Totally going to try and do this! 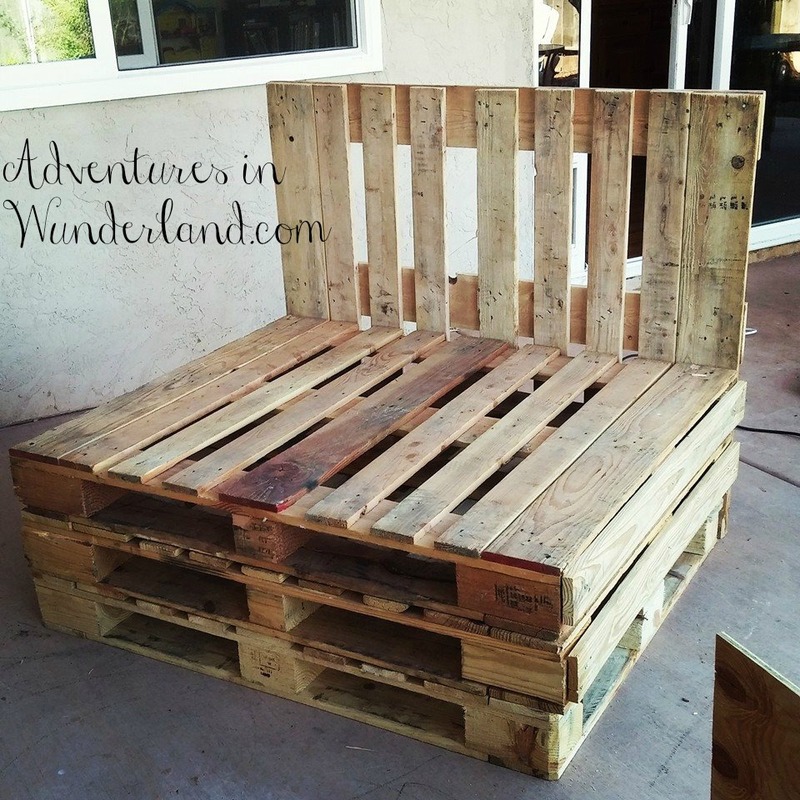 What size pallets did you use for this? Can anyone link the cushion tutorial, having a terrible time finding it. Thanks! I did....I was able to purchase sheets of foam at Home Depot (this was the cheapest option I could find) and covered with a heavy duty outdoor fabric. For the back I bought outdoor throw pillows. Was it as diffcult to move when it’s 2 stories high? I’m moving soon and am trying to decide whether to go ahead and build it and move it or build it there! How difficult would you say this is to do? I am wanting to build my own sectional but am wondering if it’s possible with my not so crafty self. Also where exactly are you supposed to place the screws? Did you do them in the middle of the the two layers for the base?